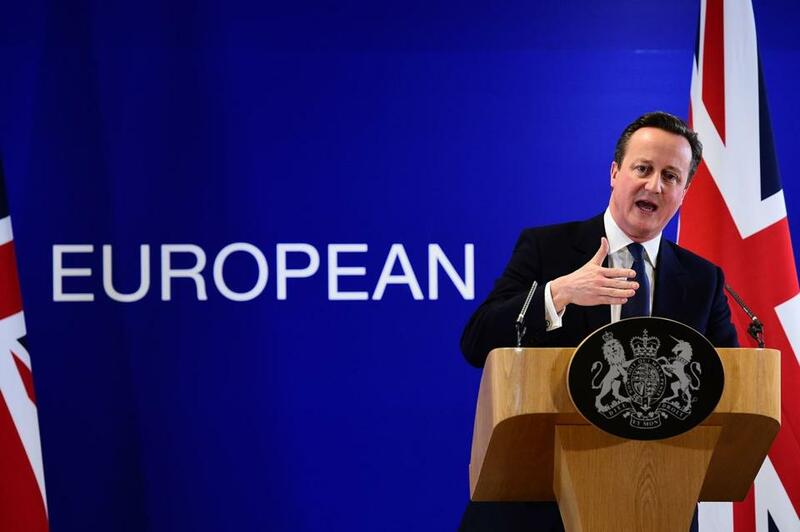 British Prime Minister David Cameron held a press conference after a European Union summit in Brussels on Friday. European negotiations were once glamorous. Five centuries ago, when Henry VIII met the French king Francis I near Calais, there was so much Tudor bling that the venue became known as the Field of Cloth of Gold. Contrast that with the grimy ordeal David Cameron and his fellow European leaders had to endure last week as they hammered out the terms of Britain’s new “special” status in the European Union. A more dowdy and disheveled group of people it would be hard to imagine than the premiers of the EU’s 28 member states by Friday evening. Viewed from the other side of the Atlantic, it all seems baffling. Can Britain’s continuing membership of the EU really depend on the number of years that a Polish plumber will not be entitled to claim UK benefits (a key stick point of last week’s negotiations)? Few Americans can fathom why the Brits are so bothered about perfectly legal immigrants from other EU states. But that is not the real issue, even if it was the one that kept Cameron up all Thursday night. The real issue — the one they will vote on in this summer’s referendum on EU membership — is whether or not my fellow countrymen have learned anything from approximately five centuries of European history. Half a millennium ago Henry VIII could still dream of asserting his claim to the French crown. But Cardinal Wolsey understood rather better that the monarchs of Christendom should join forces against the ambitions of the Ottoman Turks. That was one reason Wolsey brought Henry and Francis together on the Field of Cloth of Gold. After the restoration of peace at Westphalia in 1648, Europe entered the era we associate with the balance of power — the emergence of the great German historian von Ranke’s “pentarchy” of five great powers: Austria, Britain, France, Prussia, and Russia. The geopolitical reality was an escalating overseas contest between the Dutch, the British, and the French for the spoils of overseas empire, and an unending “Eastern Question” that pitted Russia against Turkey in war after war. For a time, imperial success gave rise to the illusion that Britain could detach itself from the continent. But “splendid isolation” was an ironical phrase. First Napoleon, then the Kaiser, then Hitler revealed that the “continental commitment” could never be renounced. So all Britons have to choose today is the form of that commitment. They can declare “fog in the Channel — continent cut off” by voting for “Brexit” (short for British exit). But the idea that they can thereby separate themselves from Europe is an illusion. For the future of Europe without the UK would be one of escalating instability. Germany, after a period of predominance between around 1989 and 2015, now faces a descent into weakness as a result of today’s revived threats from the East: the Völkerwanderung unleashed by the Syrian civil war and the increasingly reckless flailing of Vladimir Putin’s Russian petrostate. Angela Merkel’s rash decision last summer to throw open the German borders was like Brünnhilde’s immolation scene in Wagner’s “Ring.’’ At a stroke, German mastery over Europe came crashing down. Cameron, who had once thought he would negotiate his deal with Berlin, found himself haggling with 27 different capitals, from Paris to Prague. Why did he succeed? I believe it was because of a fundamental shift in what might be called the balance of skepticism. In the 1990s, the utopians were the pro-Europeans. They genuinely believed that a borderless Europe with a single currency would magically evolve into a United States of Europe, transcending the wicked nationalism of the past. The skeptics then were those of us who pointed out that monetary union without fiscal union was a recipe for disaster. We were right, and the proponents of “ever closer union” have had a huge lesson in the past few years. Today, by contrast, it is the proponents of Brexit who are the utopians. The true skeptics now are those who point out that to opt out of the EU is not only to relinquish all influence over the terms of the UK’s future relationship with its main trading partners, but also — much more importantly — to undermine the security of Europe itself. Half a millennium ago, Henry VIII’s version of Brexit was to renounce Roman Catholicism and divorce Catherine of Aragon. A skeptic in those days would have advised him to “Bremain” – and unite against the Turk. Niall Ferguson is Laurence A Tisch professor of history at Harvard and a senior fellow of the Hoover Institution at Stanford.